[London: 24th May 2018]: Today, leading London property developer EcoWorld Ballymore presented JDRF with a £40,000 donation in aid of their work supporting those affected by type 1 diabetes. The sum formally concludes a highly successful partnership between the two organisations. The £40,000 cheque was presented by Hayleigh O’Farrell, Head of Communications at Ballymore and Marcus Marland, Head of Communications for EcoWorld International UK. With health and wellbeing central to EcoWorld Ballymore’s ethos, the donation is symbolic of the developer’s commitment to improving lives. The donation will further advance JDRF’s ability to provide world-class support to those living with type 1 diabetes, while funding essential research into new treatment methods. The charitable partnership was launched in May 2017 whereby EcoWorld Ballymore hosted a Research Briefing and Reception event at Embassy Gardens for the charity. The event was attended by JDRF’s leading patrons, including broadcast journalist Justin Webb, and provided an important update on the charity’s latest research into type 1 diabetes. JDRF is part of a global network that funds world-class research into type 1 diabetes, as well as providing invaluable support to those living with it and their families. Currently, type 1 diabetes affects 400,000 people in the UK, 29,000 of which are children. It is a condition that can affect anyone at any time and occurs when a person’s immune system attacks and destroys the beta cells, which produce insulin, in the pancreas. Insulin facilitates the body’s absorption of glucose from the bloodstream, without which blood glucose levels become dangerously high. The Prime Minister, Theresa May, has publicly spoken about her own experiences of living with type 1 diabetes and has attended JDRF events. Commenting on the announcement, Marcus Marland, Head of Communications for EcoWorld International UK, said: “JDRF’s work in supporting those who live with type 1 diabetes is admirable and we are delighted to be able to support the charity with this donation, as facilitated by the sale of new apartments at Embassy Gardens”. Embassy Gardens will see the creation of nearly 2,000 new homes, stunning landscaped gardens, vibrant new bars and restaurants providing a variety of al fresco spaces and 130,000 ft² of shopping space. Phase two is being delivered by EcoWorld Ballymore and phase one, which is now complete and occupied, was delivered by Ballymore Group. 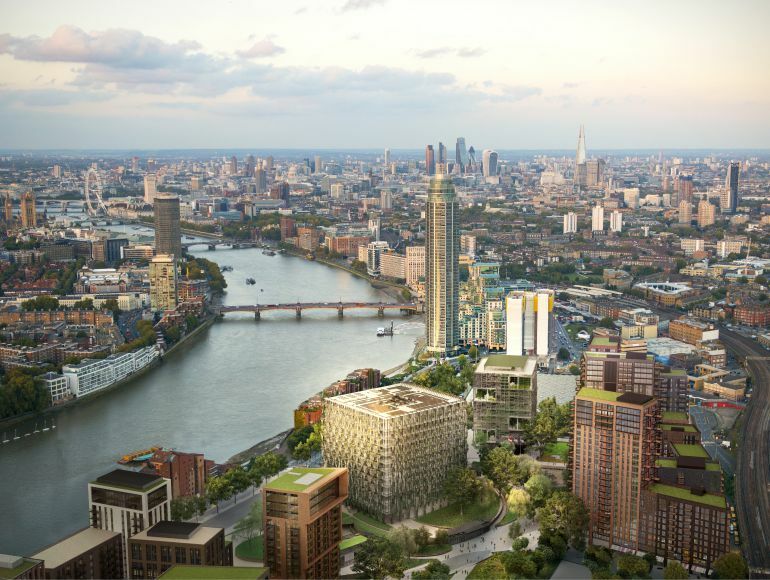 The apartments at Embassy Gardens are a 10 minute walk from Vauxhall Station and connectivity will be further improved with the forthcoming extension of the Northern Line, creating two new stations at Nine Elms and Battersea Power Station. Future home to the Sky Pool, Embassy Gardens is a landmark development which will establish a totally new community within central London, wrapped around the new US Embassy. JDRF is the leading global organization funding type 1 diabetes research. Our mission is to accelerate life-changing breakthroughs to cure, prevent and treat type 1 diabetes and its complications. To accomplish this, JDRF has invested more than £1 billion since our inception. We collaborate with the most talented minds to develop and deliver a pipeline of innovative therapies to people living with type 1 diabetes. Our staff and volunteers around the globe are dedicated to campaigning for our vision of a world without type 1 diabetes. For more information, please visit jdrf.org.uk or follow us on Twitter: @JDRFUK.